Thursday, September 13, 2018: Flo looks to be essentially a no-go for our area, short of what will become seemingly unending 20-mph onshore winds and showers aplenty. Right now, there could be as much as a solid five days of onshore winds. This means moderate road flooding on a damn-near daily basis. It also means a steady beatdown of the beaches. I can’t see any surfcasting for quite some time to come. Had the tip of Holgate been opened, there would have been some hope there except for the fact the chain is up at the parking lot, preventing vehicular passage to reach even the open zone. GUSTY BASS DRAW? : While I’m hard-pressed to keep up my optimistic surfcasting demeanor in the face of all this wind, I’m over-stretchingly wondering if the steady, long-term stir might not soften the beaches for bass to then heartily feed close-in, as we inch toward migration time. The churning ocean surface has busted up the nearshore bunker balls, which I feel have been drawing the bigger bass from our surfline. When the easiest available vittles are rolling in the beachline swash, stripers will not hesitate to resort to their lifelong standby behavior of dining on crabs, worms and other crustaceans. 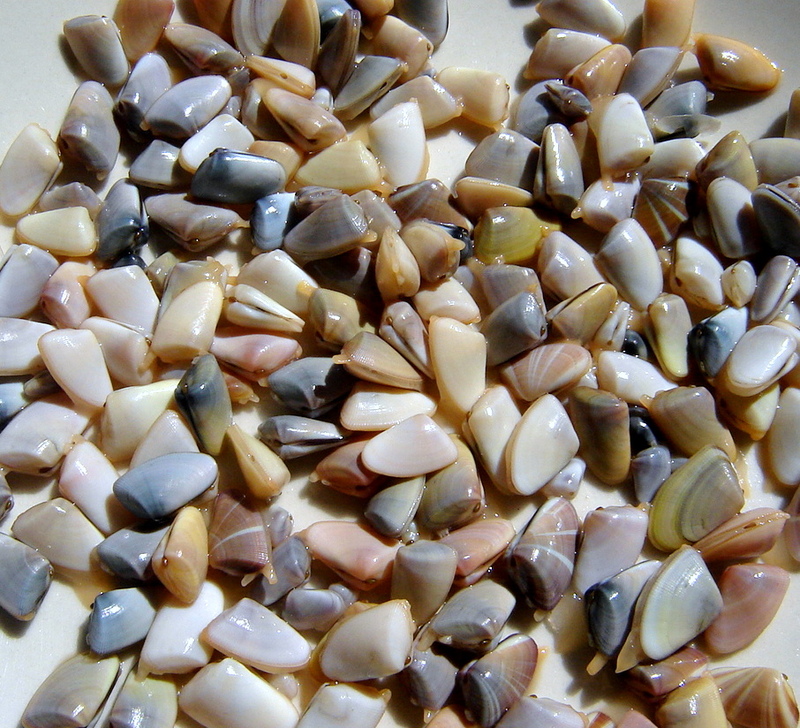 I can’t include surf clams (Spisula solidissima) in the above swash buffet. Those big bivalves are thoroughly gone. Virtually no suitable theories on their sudden disappearance have been made short of the Late Capt. Bill’s assurance that freshwater runoff from treated sewerage drove them out, i.e. killed them, since clams aren’t adept at rushing off to new and saltier digs. On the subject, how can one not see how the devolving dearth of stripers in the surf aligns perfectly with the disappearance of near-in surf clams? Think back on how often we found the bellies of all bass, even trophy mega-stripers, loaded with surf clam meat? Losing such a belly-filling forage item like surf clams has to discourage stripers from hitting the LBI shallows, especially in the wakes of storms. In fact, if I had to pick between regulation-protected bunker and AWOL surf clams being the bigger factor in drawing our surf striped bass farther seaward, it would be the lack of clam meat. As to new swash edibles, I’ve gotten reports of landed bass filled to the proverbial gills with coquina clams; mainly smaller just-keeper fish, though. Hey, I’m grabbing at anything to draw the bass back into the surf fold. And, no, I’m not even slightly dissing boat bassers. I’ll bet the barn you guys will be having your way with big fish for many moons to come. I’m just hoping nature starts to divvy bass out a little more equitably. CHITALS SNUCK IN: Seen any oddly spotted deer bounding about lately? No, I’m not talking white-tail fawns but fully-grown axis deer, also known as chital -- from the Sanskrit citrala, which mean "variegated," referring to the deer’s spotted coat. As might be surmised from that Sanskrit lingual angle, this is not an overly indigenous cervid -- a cervid being any member of the deer family. It harkens from India and such. Well, some folks down Cape May way thought it would be a swell idea to bring in a little bite of India, illegally sneaking three chitals into the heretofore chital-less Garden State. Such an importation had to take some serious legwork, transportation-wise, likely spurred on by some tasty long-term hunting intention. Of course, it might have simply been an attempt to open a “Calcutta Chital Petting Zoo and Car Wash,” behind a gas station. Whatever, NJ’s Bureau of Wildlife Management was not enamored, knowing that any outsider cervid, even indigenous species from neighboring states, could be bearers of deadly prion diseases, like chronic wasting disease, an awful illness marked by the wasting away of infected deer. “The movement of cervids from nearby states known to be positive for CWD is a major risk factor for the disease being introduced into the state,” reports the Bureau. Important: CWD/Prion disease has not been documented in NJ to date, though hunters have sworn up and down they’ve seen it out there. Once seized, the three clueless chitals were immediately euthanized. Internal parts, primarily retropharyngeal lymph nodes and obex tissue (brain), were rushed off to the UPenn New Bolton Center to be tested for CWD. The results are not yet available. Axis deer are threatening parts of Texas. Axis deer sport an orange coat dotted with white spots, not unlike a whitetail fawn, and white patches on their throats. The males grow massive antlers, usually with three to six points, and can weigh up to 250 lbs. Similar to the elk, these deer are also extremely vocal, letting out distinctive sharp, barking sounds to communicate. Males are even known to bugle.How did they get here? Originally from southern India, Nepal, and Sri Lanka, the axis deer was introduced to Texas in 1932, ideally as a game animal. At first, this worked out well. They were restricted to farms and controlled hunting sites, and provided ample meat to anyone who could bag one. Of course, as often happens with animals in captivity, many axis deer eventually escaped to run wild around Texas. While the vast majority of axis deer remain in captivity, over 6,000 of them now roam freely, taking advantage of the warm weather and ample grasses similar to their native land. Though not known to be an aggressive species, the primary threat of the axis deer lies in the fact that, large as Texas is, there simply isn’t enough room for two thriving species of deer. 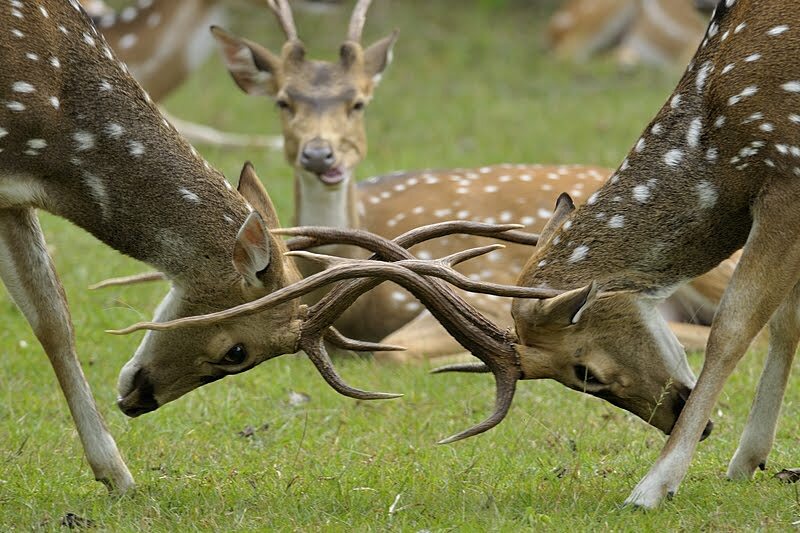 The axis deer and the whitetail must compete for resources. Unfortunately, the whitetail aren’t the only ones to suffer. Local farmers must now protect their fields and gardens from this larger, bolder forager who stands to ruin their fields. The axis deer is also unfortunately hardy, which is likely one reason they were introduced in the first place. While one might expect a foreign species to succumb easily to diseases in a new environment, the axis deer do not. In fact, they are more resistant to outbreaks than the whitetails so, while whitetail populations are often culled, the axis populations continue to grow. As is common with invasive species, the axis deer also have few natural predators. While coyotes and bobcats will go after them, they are powerless to make a significant dent in the axis deer population. Recent storms accompanied by high winds and large waves have kept the boats of the Beach Haven Charter fishing Association at the dock. These conditions along with the landfall of Hurricane Florence to the south have the captains thinking of their own storm contingency plans. Captain Dave Kreines of the “Byte Me” says he keeps an eye on the weather and plays it by ear. He adds extra lines and plans to pull his boat out of the water on a trailer if the storm looks bad. If it just looks like a lot of rain he inspects his bilge pumps to be sure they are ready to go with batteries fully charged. .He plans to be back at the fluke grounds when things calm down. Captain Carl says after the storm it will be time to go fishing. Fluke season will be followed by black sea bass and then by stripers. He was catching lots of short fluke, with a ratio of 20 shorts to 1 keeper, and many sea bass out on the inshore reefs before the storms started..
Captain Lindsay Fuller had run two Mid-Range Tuna trips on the “June Bug.” right before the storm to the 30 Fathom Knuckle finding no tuna but did catch some mahi to30-pounds. Captain Lindsay has made deposits on foul weather availabilty to get hauled at Jersey Cape Yachts in case of a real hurricane threat. Additional information on the BHCFA can be found at www.bhcfa.net. Captain Lindsay Fuller had run two Mid-Range Tuna trips on the “June Bug.” right before the storm to the 30 Fathom Knuckle finding no tuna but did catch some mahi to 30-pounds. Captain Lindsay has made deposits on foul weather availabilty to get hauled at Jersey Cape Yachts in case of a real hurricane threat. Resourceful little brats. They turned an old bloodworm into a spot. Cut the spot and caught a couple snapper blues. Stripped the blues and boxed two keeper fluke. Things in the works !! Anything else people would like to see let me know!! Washington, D.C. — In a new report from the Center for American Progress, fishermen on the front lines of climate change describe the impact of warming oceans on their jobs and in their regions. SeafoodNews summarizes the report in a series of articles starting with the impacts on Florida’s fishing industry today. Tomorrow we cover the Mid-Atlantic and New England. On Monday, September 17, we look at the West Coast and on Tuesday, the Alaska fishing industry. The report notes that while some members of Congress still debate the existence of climate change, fishing communities are forced to seek emergency disaster relief funds in the Pacific, change their business practices in New England, and target new species up and down the Atlantic seaboard. The authors of Warming Oceans, Falling Fortunes interviewed fishermen across the country in 2017 and 2018. Extreme weather events and sea level rise also put the physical infrastructure of coastal communities at greater risk. In 2017, Billy Kelly, executive director of the Florida Keys Commercial Fishermen’s Association, estimated that Hurricane Irma destroyed or scattered more than 40 percent of the spiny lobster traps in Monroe County waters just one month into the season, devastating a $50 million industry that relies on the most valuable commercial species in the Florida Keys. With 1,350 miles of saltwater coastline, commercial and recreational marine fishing is a big business in Florida. In 2015, Florida’s commercial and recreational marine fishing industry supported 176,000 jobs and generated $28.7 billion dollars in sales, ranking as the third-highest state in employment impacts and second-highest state in sales, income, and value-added impacts. Florida leads the nation in recreational fishing trips, jobs, and local taxes generated by sportfishing. Saltwater-fishing license fees generates $26.8 million dollars a year, 46 percent of which come from out-of-state fishermen. Yet, warming waters and more frequent extreme weather events are taking their toll on the resources that support this key economic sector. U.S. fish stocks are managed on a regional basis, with quotas set by regional fishery management councils and state agencies based on historical catches and regular scientific assessments of fish populations. As ocean temperatures skyrocket, heat-sensitive fish and other marine life are moving to more comfortable waters, causing a mismatch between where fish actually are and where they are allowed to be caught. This leads to severe economic hardship for fishermen and the businesses and communities they support. “Cobia are very much a migratory fish, and their migratory patterns from Texas and Florida are both about six weeks off,” said Brandon Shuler, a professor at the University of South Florida and an avid recreational fisherman. “There are some regions in the United States where the fishing season is historically open during a certain period of time, and now, the fish aren’t coming until after the season is over,” Shuler said. When the Florida Fish and Wildlife Conversation Commission (FFWCC) received a flurry of reports that cobia catches were declining along the Florida Panhandle, they reduced the catch limit in the northern Gulf of Mexico. Meanwhile, further south, cobia catches were plentiful. FFWCC Commission Chairman Brian Yablonski wondered if the cobia that typically migrate up into Florida’s Panhandle were staying in Central Florida. What was causing it? In the winter of 2016, ocean temperatures in the Gulf of Mexico did not dip lower than 73 degrees Fahrenheit. Cobia prefer warm water temperatures above 68 degrees Fahrenheit. They migrate north in the summer months, possibly to stay in their preferred water temperatures. The warm water temperatures in the Gulf could be contributing to cobia population migration changes. Terry Gibson, a former charter fisherman and lifelong recreational angler, believes climate change is also causing shifts of king mackerel populations. Gibson and others have noticed a change over the past five years in the area where South Atlantic king mackerel and Gulf of Mexico king mackerel populations meet to mix. “I can show you my logs and my depth finder that [the water is] 2 or 3 degrees warmer almost all the time,” said Gibson, whose story matches the available science. Gulf of Mexico king mackerel, like cobia, spend summers in the northern part of the Gulf of Mexico and migrate south in the fall. At the same time, a separate Atlantic population of king mackerel also migrates south in the fall, and the two distinct groups eventually mix along the southeast coast of Florida. Recently, however, scientists have seen the mixing zone of the two populations of king mackerel shifting to the south side of the Florida Keys, because the water is colder there. Fishermen have also noticed distinct changes to the sailfish migration, which affects sailfish tournaments, jobs, and tourism revenue on the southeast coast of Florida. Thanks to catch-and-release fishing and a ban that prohibits destructive longlining in the straits of Florida, sailfish in the Jupiter area are one of the few populations that is not overfished. “Since 2003, you could almost guarantee a catch for a customer, and odds are you would probably catch four or five [sailfish]. The colder it is, the better it is for this fishery, so you would go during nor’easter fronts,” Gibson said. Captain Randolph “Bouncer” Smith, a charter boat captain based out of Miami Beach, Florida, recounted similar stories of his 50 years in the charter industry. “In the 1970s [and as recently as 2005] in November and December you would have great sailfishing, and in January and February, everyone would jump out of their skin when there was a cold front. You would see 20 sailfish fighting over your bait. Now you don’t see those waves of sailfish, because it’s 80 degrees in winter. And it has a big impact. You used to see 30 charter boats, and every boat would be fishing two half-day trips through Easter. 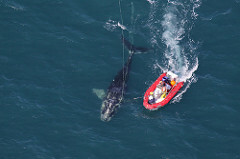 Now, with the lack of fish and warmer water, there might be five boats out of 40 in Miami who are able to fish,” he said. The sailfish, Smith noted, are now being seen off the coast of South Carolina and in areas where there are no established fishing tournaments or charter fishery clientele. Smith described many days in the winter now when his customers have nothing to catch—hurting both his marketing ability and bottom line. He believes the fish are comfortable staying north, because the water has gotten warmer. The National Marine Fisheries Service is sending more than $6 million to nearly 30 marine conservation projects as part of its Species Recovery Grant Program. Other grants include an award to the Connecticut Department of Energy and Environmental Protection to help sturgeon in the state’s waters. The Virginia Department of Game and Inland Fisheries will work on response to stranded sea turtles.